We stock a full range of interior and exterior paints and stains by Benjamin Moore and Cabot. There are several different sorts of finishes for paint products. The finish is the texture, sheen, or shine level paint has. Each option has advantages and disadvantages. FLAT: Flat paints have the least shine, and tend to have a somewhat chalky feel to them. Benjamin Moore has been working to make their flat paint more washable over the years, even though flat paints in general are not known for their wash ability. Flat paints tend to hide imperfections in the walls easily. EGGSHELL: Eggshell paints are one step glossier than the flat, but they are still not overly shiny. They get their name from the texture of the shell of an egg. They are more washable than the flat paints, and are not as chalky feeling. This is a popular option for interior walls, as eggshell paints also help to hide imperfections in the wall. LOW LUSTRE: Low lustre paints, in the Benjamin Moore product lines, tend to be for exterior paints. They are not terribly shiny, though have more glass than eggshell. This is most often used as the paint for siding, with a complementary trim that is shinier (see Semi-gloss). Low luster is shiny enough to shed rainwater well, but dull enough not to reflect much sunlight. PEARL: Pearl is fast becoming a popular choice for those who don't want a shinier wall surface, like you get with semi-gloss, but who don't want the rougher surface they get with eggshell. Pearl has a soft shine, not unlike a pearl, that does not emphasize wall imperfections, but it doesn't mask them as well as the less glossy paints. Its washability is greater than that of eggshell, though still not as washable as a semigloss or gloss enamel. SEMI-GLOSS: Semi-gloss a relatively shiny gloss. It is most often used for painting trim, either inside or outside, as an accent to a less glossy wall surface. It sheds water fairly well (exterior) and is the most washable of the common interior paints. Imperfections in the wall tend to be emphasized with a semi- gloss, as the reflection of light helps to show any surface irregularities. GLOSS: Gloss is not just a term used to describe how shiny a paint is. It is also used to describe the shiniest gloss level in paint. High gloss is usually either an enamel or a house paint. Traditionally, house paints were either flat or high gloss, and oil based. Today, these products are still available, if in a different form. The shiny surface of a gloss paint sheds water very well, and tends to be durable. Gloss paints are still not chosen often, because they are, for many people, "too shiny". INTERIOR: paints are strictly for use on walls inside the home. They do not have enough substance to fight the elements for very long, and they do not seal the substrate well. With that in mind, interior paints are ideally suited for adding some color to your walls, and for sealing drywall or plaster. Their drying time is relatvely short, there is a variety of textures, and they are formulated to handle the very different environmental conditions INSIDE your home. EXTERIOR: paints are made to protect the outside of your home from rain, snow, and other normal weather events. You might think this makes them perfect for protecting your rooms inside the house as well (after all, if it can stand up to snow and rain, shouldn't it handle a dog and a three year old?). In reality, some people actually do this, but we can't recommend it. The paint takes much longer to dry, and is not designed to withstand the conditions inside a home. Outside is where exterior paints belong. There are a few that are made to be used in both locations. They are clearly labeled, but be sure to read the label for the manufacturer's guidelines for application. There are two main basic formulations of paint, latex and oil. Oil paints are the more traditional paints, and have been around for a very long time. Latex paints are a more recent innovation, and one that has been embraced by a vast number of people. OIL: Oil based paints, also known as "alkyd" paints, are generally thought of as a more penetrating paint. The oils that the paint uses tend to go deeper into the pores of the surface you paint, and bond at a deeper level. The down side is that they can yellow over the years, and that in order to clean it up, you need to have paint thinner, turpentine, or other mineral spirits at hand. And just because oils penetrate deeper into the substrate (i.e. into the wood or whatever), it does not mean that an alkyd paint will never peel. Most paints will peel if water gets under them, or from weathering through time. LATEX: Latex based paints bond to the surface, and so are useful for a number of applications. They provide a good seal at the surface, and maintain their color well through time, without the yellowing alkyd paints are known to have. They clean up with water, and dry in a relatively short amount of time. These are the main reasons so many people have opted to use latex paints, especially inside their homes. Perhaps the biggest question people have is whether one sort of paint can go over another. For a long time, conventional wisdom said that if you started with oil, stick with oil, and if you started with a latex-based paint, stick with latex. Several years ago, this was changed slightly. Now, the "word on the street" is: Latex paint can go over an oil based paint. Oil paint should only go over an oil paint. Or, simply put, latex can go over most sorts of paint, but oils should only go over oils. Of course, there are plenty of different opinions about this, and there are many people who will put anything over anything, and have no problems. Still, manufacturer recommendations are to put like over like, or latex over both. What Color Do I Pick? Colors darken over large areas. When you choose a color from a small chip, dark colors appear eye catching and rich. When that same dark purple is spread all over the wall, that same rich color has darkened the room considerably. A little bit of color can go a very long way when you paint a room. What seems too light in the store may just be perfect in your home. This does NOT mean that dark colors don't work in the home. If that is your design choice, we are certainly able to custom tint your paint to exactly how you want it. What we recommend is that you bring a paint chip home and look at it in the room where you are thinking of putting it on the walls. The best way to insure that you can paint a small spot on the wall without repainting the whole thing is to get extra paint when you do it the first time. Even stock colors can have a little drift in color over time, so that the match is less than perfect. If you keep the excess paint from the job, and make sure that it doesnâ€™t dry out, then you will know that you have the same color. 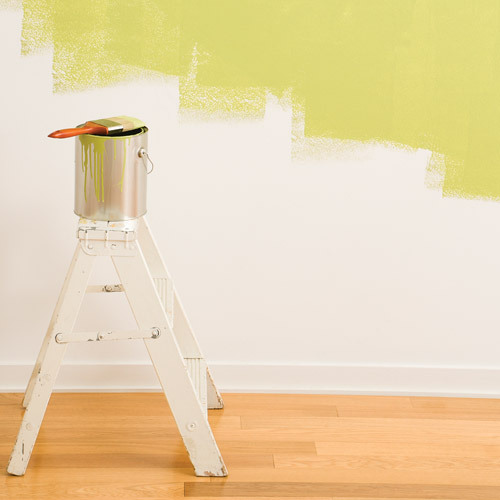 Be aware that the paint n the wall may still fade or change color slightly with age, so that the older the can of paint, the less likely it is that it will still match perfectly. It should be close enough to paint over a nail hole or repair, but it will not look exactly like new. Dark colors are difficult to cover. If you decide that the dark magenta room is too dark, and that it should be simple white, there are a few tips that will serve you well. Use a primer over the dark paint. It will help to hide the darker color and save you money in the long run, because it will take fewer coats to cover. Be prepared to do at least 2 topcoats, especially if you are using a paint roller. Doing 2 coats is the only way to ensure an even coat of paint on the wall. This is a good idea even when you are doing a wall for the first time. If you are trying to "touch up" a few rough spots on an older wall, it is unlikely that you will find a paint that matches so well that you won't notice the difference between the fresh paint and the older paint. If enough time has gone by, even paint from the same can will look different. The sun fades colors over the years, and touching up walls will show you just how much work the sun has done. In the case of matching an older stain, there is very little way for us to match it exactly. Wood darkens over time, and while we do have some stains that can simluate that aging process, there is no guarantee that they will continue to look the same over time. Wood that was stained 50 years ago will have a rich patina that might be closely matched today, but you will notice some difference if you look hard enough. Paint draws colors out of patterns. When you choose a color, keep in mind that if there is a subtle color in the fabric of your furniture that matches or resembles the wall color, that hue will be drawn out of the fabric by the eye. This can be a very useful trick in decorating and room design. It helps to create a small contrast against the main coloring of the furniture or picture, but a contrast that helps to draw the whole piece into the room. In many cases, using a pattern in upholstery or in artwork can create a nice combination of coloring and liven up a room that might otherwise seem a little bland. Primer is a great idea. Priming a new wall, whether it is plastered, drywall or even raw wood, is a very good idea. Paint manufacturers often will not guarantee their products fully without a coat of primer underneath them. Primer binds the surface and prepares it so that the paint will bond to it properly. This means less chance of peeling later, and a longer lasting paint job. This is the easiest way to match paint. The can will tell us not only what the color is, but also what sort of finish it is, and whether it is interior or exterior. It is not odd to bring in a hunk of siding or a swatch of wallpaper in order to get a close match. We can try to match them to existing colors by eye, or we can "shoot" them with the color match system, as long as the area of color you want is at least as large as a dime. Having a color name ahead of time is obviously a good thing. Just be ready to tell us what sort of finish you want to use, and whether it's for interior or exterior use. With exterior products especially, it is easy to confuse stain and paint. A solid stain looks very similar to paint in the can. Both have a lot of color, and neither allows the grain to show through. A stain will let the texture be more visible, though, while a paint coats the surface with a thicker coat, concealing some of the irregularities of the surface. With interior finishes, it should be easy to tell whether you have a paint or a stain. If the woodgrain is clearly visible, then you probably are dealing with a stain. There are a few interior stains available that have tints that are other than just the basic browns and dark browns, so it pays to notice what it is you are trying to match. The amount of paint or stain varies somewhat, depending on how dry the surface is, and whether it has been sealed with a primer. A primer will generally cover from 400 to 500 square feet per gallon, depending on how porous the surface is, and how dry it is. 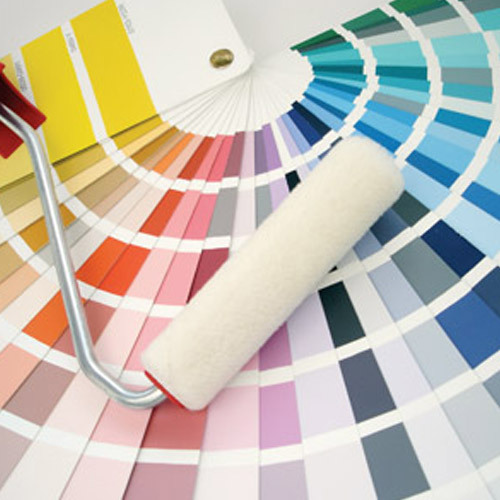 Paint can cover anywhere from 300 to 450 square feet per gallon, also depending on the surface you are painting. A drier surface will absorb more paint, much like a sponge, and so will cover less area. You will obviously also get less coverage if you spread the paint in thicker coats, but you may also get better coverage. Thinner coats will cover more area, but may not cover as completely.